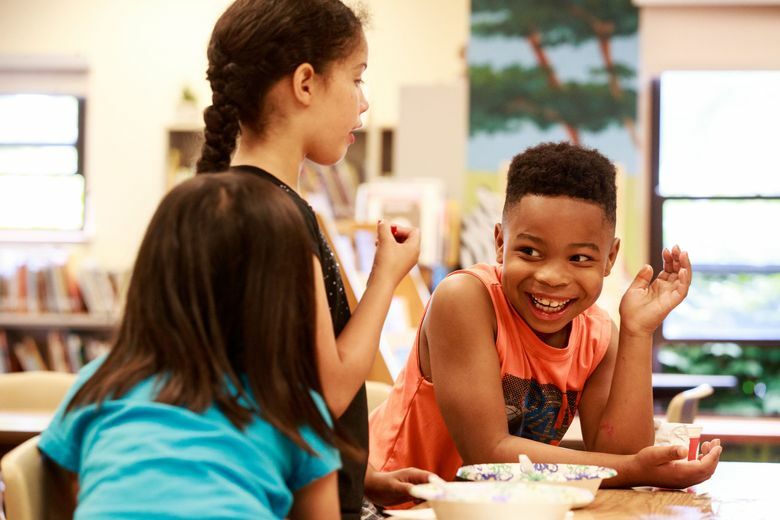 Seattle's Leschi Elementary just finished its second year of a blended Montessori-contemporary program supporting racial balance a unified school community. So far, it seems to be working. A music concert was coming up, and students on the equity team at Seattle’s Leschi Elementary raised concerns about a classmate who uses a wheelchair. There was no way for the boy to get on the stage, so he wouldn’t be able to perform next to everyone else. And that, the students said, wasn’t equitable. Could they build a ramp? 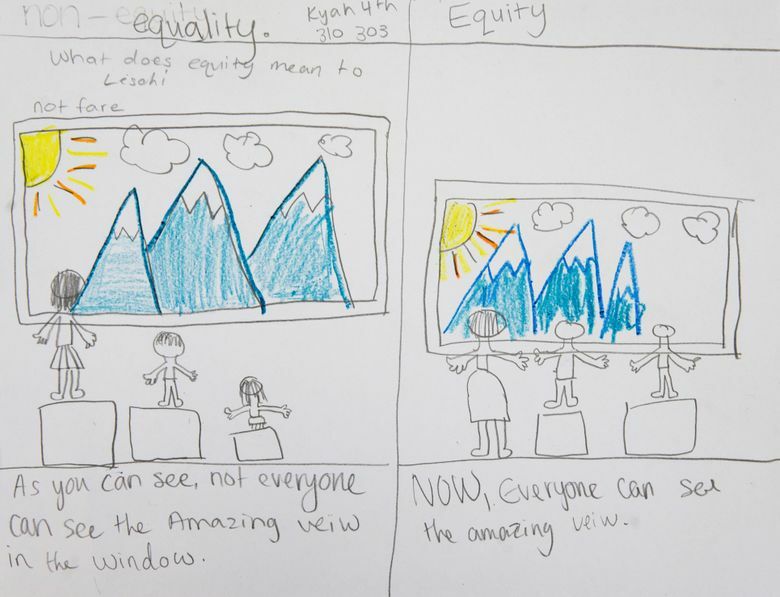 Such conversations about equity are now common at Leschi — among teachers, parents and, increasingly, students. Leschi used to be a divided school, with mostly white students in its Montessori program, and mostly students of color in what it called its “contemporary” classes. The divide bothered teachers and many parents of all backgrounds, and they decided it had to change. Kids who may not have interacted before have playmates and sleepovers together. Teachers and parents say the school feels more like one community. There are only two years of data, but in that time, standardized test scores have gone up. That’s a good sign, said Gerald Donaldson, the school’s family-support worker. “If the scores are across the board, it means something is working,” he said. And the discussions in the student equity team, formed this past school year, are as difficult and deep as the ones adults have had about inclusivity, bullying and social justice. When Donaldson was a child, the neighborhood around Leschi was home to many Jewish families, and his family was one of the first black families to move in. Then black families filled the area. Now the neighborhood is changing again, with a growing number of white and upper-income families moving in. “I still adjust, having grown up here, with the gentrification, to see how the neighborhood has changed,” Donaldson said. About half of the school’s 360 students qualify for the federal free or reduced-price lunch, a decrease from about 70 percent five years ago. Donaldson attributed some of the decrease to lower-income families having to move farther south because of rising housing costs in the city. And about 80 students are homeless, with some coming to school from transitional housing in West Seattle, Auburn and Kent. One girl wakes up at 5:30 a.m. to get to school on time. 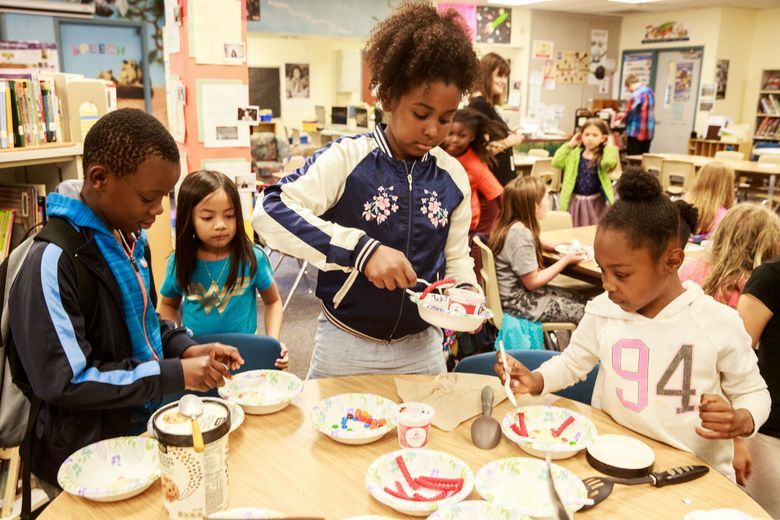 The classes were more racially balanced when the Montessori program, which emphasizes student-guided learning, started at Leschi. But a kind of de facto segregation soon developed. When the students lined up on the playground before school, it was obvious some classes had more students of color than others, said Lynn Heinisch, whose second-grader was in the regular program in kindergarten. Blending Montessori and contemporary — students have Montessori math for a part of the day and writer’s and reader’s workshops and science from the teacher-guided contemporary curriculum another part of the day — was a step toward a diverse, single school. Best of Both started with just one K-1 classroom in the 2014-15 school year, led by teachers Danielle Guzman and Valerie Chin. Starting in the 2015-16 year, it expanded to the whole school. For Guzman, this year was one of her most challenging as a teacher but the smoothest when it came to the blended model. Her students faced more obstacles this year than in the past, but incorporating the Best of Both approach wasn’t nearly as stressful. Unlike the first year, she said, she didn’t feel like she had to constantly defend the move. In that first year, some questioned whether families would leave. Some have, which Claytor says could be attributed to the new program, but no one said so. The school’s enrollment is increasing to the point that they’ll be adding two more classrooms of students next year. Some families have come specifically because they liked what the school is doing. One was Kelly Smith, whose son just finished first grade. She isn’t sure if she would have enrolled him in Leschi if there were still separate tracks. “I didn’t want to send my children to a school that, in my mind, would be segregated because of having two programs,” she said. Her son, who is white, is exposed to a variety of cultures and perspectives, and “sees himself as one of many, rather than seeing diversity as ‘other’ or ‘atypical,’” she said. Some at Leschi said the transition has been the most difficult for teachers who previously had little experience working with students who are homeless or English-language learners. Though teacher turnover has remained steady, some still struggle with the new model, wanting to focus only on the curriculum they’re accustomed to. Still, Guzman thinks the staff will get more comfortable as time goes on. After the change, Guzman also taught University of Washington seminars alongside her husband that focused on Leschi. Mirroring the school they study, UW students and Leschi staff members learned side-by-side. The group would talk about the issues the school was facing and how to solve them, like forming the student-equity team and parent nights for different groups of families. Sometimes, Claytor said, kids and adults are still caught off-guard when they realize school staff want to hear what they have to say, instead of being told what to do or what will happen. One of the biggest issues the students wanted to address this past school year was bullying, but they also looked at other equity issues, like the stage ramp — which the school didn’t get a grant for, but they’ll try again next year — and how some bathrooms are cleaner than others. The bullying is being curtailed by their work, they said confidently at the last meeting of the year. They created the “Turtle Award,” given to a student who, like a turtle, sticks his or her neck out to help somebody. Coco Blakemore, 11, said some kids have made racial remarks in the past, but just a few. And the team is helping with that, too. Fifth-grader Steve Meginow, 11, recalled a time when he saw classmates writing mean things on a bathroom wall. But “Leschi is a respectful place,” he said, so he told them to stop, using language he had learned from the equity team. Myeesha Parker’s son was one of only a few black students in his Montessori class when she decided to enroll him three years ago. Her family hadn’t heard much about the Montessori method before, but her son had had a difficult time at another elementary school, so she thought a different approach would work better. Her family was intimidated when he first started, thinking they were taking a gamble and wondering if the Montessori program would make him dislike school even more. And, perhaps subliminally, Parker wondered if her son belonged in a program where most of the students didn’t look like him. She had experienced a similar feeling when she was a student at Garfield High School. “When you don’t see yourself, you think ‘Well gosh, that might be too hard,’ or ‘My kid doesn’t belong,’” Parker said. She now says the Montessori program helped her son catch up to his classmates. When he first entered Leschi, Parker asked his teacher if he should be held back because his grades were behind everyone else. His teacher said to wait and see. Being in Montessori was like someone “turned the lights on for him,” Parker said. But she recognized that there are also good parts about the contemporary program. She credits Leschi’s Best of Both model as a reason her son earned a scholarship to attend a private middle school next year.